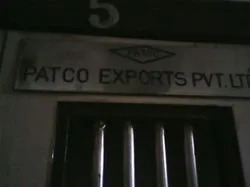 Established in the year 1991, we, “Patco Exports Pvt. Ltd.”, are one of the paramount organizations that is involved in manufacturing, exporting and supplying high quality Textile Machines and Spare Parts and Material Handling Equipment. Our range of products such as Spinning Spares, Spinning Machinery and Weaving Spares and many more. The range made available by us is manufactured using high-grade components and other material, which is procured from most trusted and reliable vendors of market with the aid of our sourcing agents. All our products are widely acknowledged in market for their outstanding performance, longer service life, low maintenance, reliability, corrosion resistance, dimensional stability, high efficiency and precise engineering. Moreover, to cater to the diverse requirements of clients, we offer these products in variegated specifications at market-leading prices. We are supported by a multifaceted infrastructure for carrying out the business operations in a swift manner. This facility is equipped with advanced technology and high-tech machines that are essentially required in the manufacturing process. Our R&D experts conduct extensive market researches to improvise the offered range. Post-production, our experienced quality controllers stringently inspect these products on certain parameters of quality so as to ensure their flawlessness. Furthermore, our logistics personnel make sure that the consignments are timely delivered at clients’ destination using easy transportation modes. Owing to these reasons, we have garnered a vast customer-base across the globe. Under the profound guidance and notable tutelage of our director, ‘Mr. Harsh Gajjar’, we have consolidated our market position. His brilliant managerial skills, in-depth knowledge and vast industry experience have enabled us to carve a remarkable niche in the industry. Outsource Manufacturer, Trading, Importer AND Exporter of Textile Machine AND Spares Parts. We hold the best in class infrastructure and operational dexterity. With a proven track record of serving the heightened demands for our advanced pieces of equipment, we are managing our assets by improving our infrastructural structure. Lying across a wide area, our job conditions is perfectly outfitted with excellent technology and high-speed machines at the product division supporting us the competency to work upon the state of art production, feature testing and delivery capabilities. Our team members are the most significant asset to the company. Their distinguished social and educational background in combining to the diverse viewpoints authorizes us to recognize the power of multifariousness and change. Our team includes remarkably experienced professionals comprising product designers, production specialists, quality inspection executives, skilled workforce and highly qualified sales and marketing staff. We are distinguished amongst the most awarded and stable company offering a price effective collection of Textile Machine and Spares Parts for our huge client base. Our products are strongly acknowledged by the customers for their high production rate, hassle free working and longer life.